St Giles Farmers' Market in Kent was listed as one of the Top 12 UK farmers' markets by Times Online earlier this year. Its home is an 11th century church in the village centre of Shipbourne and offers everything you'd expect from a good food market as well as Chinese and far-eastern basics; condiment sauces; fruit juices; honey, jam and preserves; and organic, additive-free meat and sausages. This market has a very supportive community who help to create a fantastic sociable atmosphere every weekend. 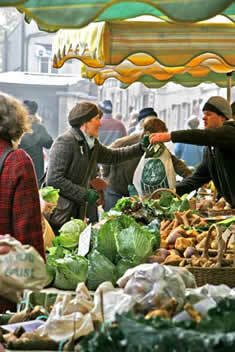 Stroud Farmers' Market in Gloucestershire was recently voted FARMA Certified Farmers' Market of the Year 2008. It has also won the Cotswold Life Magazine's Best Farmers' Market award three times. Stroud's charming winding streets fill with market stalls and the market café in Cornhill Market Place becomes the town's social centre. You can buy organic burgers, gluten-free sausages, Thai food and smoked garlic - all to the tunes of local musicians. The community's energy and enthusiasm for this market make it a lively day out. Wirral Farmers' Market in New Ferry, Merseyside was voted Britain's Best Farmers' market in the 2007 BBC Food and Farming awards. This market has a strong recycling policy, is volunteer run and all profits go towards local community projects. With everything from ostrich and buffalo meat, to hand made chocolates, marinated olives, chilli growing kits and locally brewed beers, brews and bitters this is a market with variety. If you think your local farmers' market is worth shouting about do let us know where it is and why you love it so.